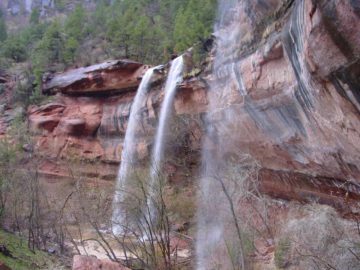 The Zion Canyon Waterfalls are more typically the ephemeral types that don’t last much longer than a few days after heavy rain. However, since afternoon thunderstorms occur frequently during the monsoon season of mid to late summer, there’s a good chance you’ll see these falls if you’re here during that time. On the other hand, we were fortunate to see these waterfalls in mid March during a Spring rain storm that made these falls come alive. 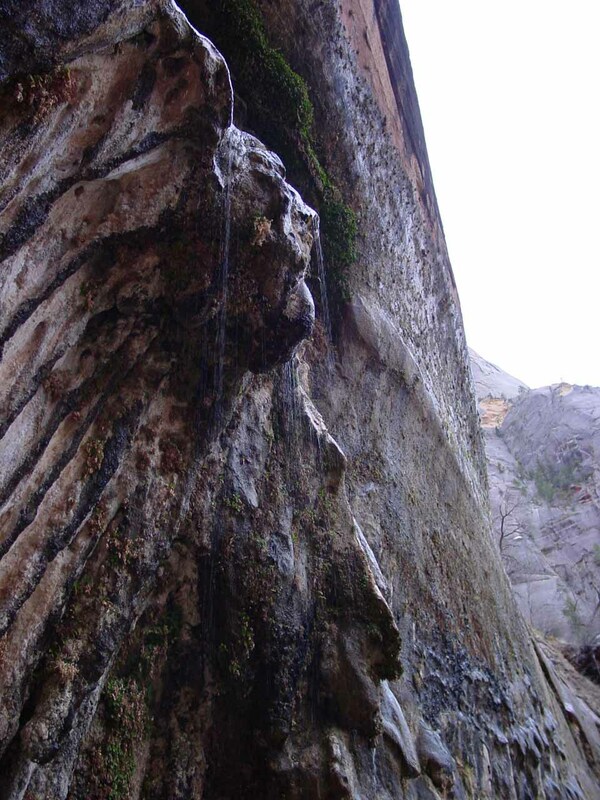 But like I said, timing is everything and thus we believe most of these waterfalls marginally count as legitimate due to their lack of reliability of flow. 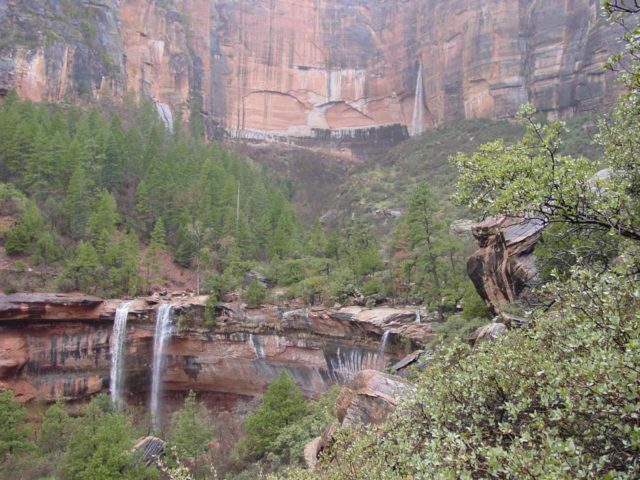 Some of the more prominent waterfalls that we noticed that had a little more staying power than the typical ephemeral waterfall that would be gone after a few hours included a trio of waterfalls at the Lower Emerald Pools, an attractive 300ft waterfall at the Upper Emerald Pool, and a gorgeous tall waterfall at the Temple of Sinawava. 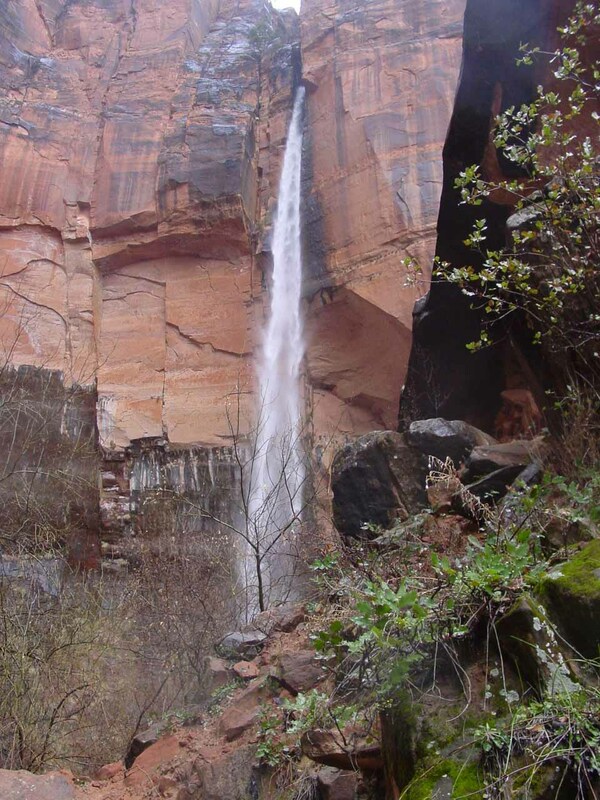 This web page was my excuse to showcase and celebrate the beauty of some of the waterfalls that can be found within the main part of Zion Canyon if the timing’s right, of course. 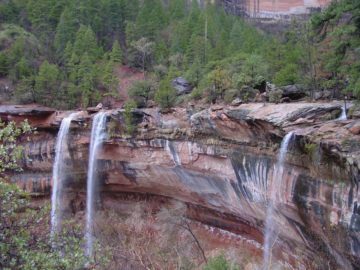 As for the specific waterfalls themselves, the Emerald Pools was about 2.5 miles round trip that included the Upper Emerald Pools (and its tall waterfall) and could be done as a slightly longer loop hike. Alternately, if we had just done the Lower Emerald Pools, it would’ve been 1.2 miles return. 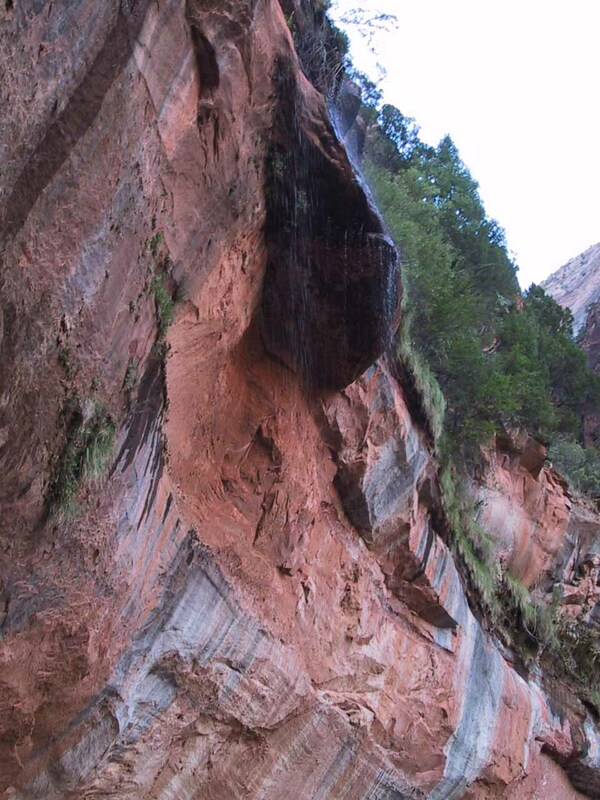 The walk was pretty easy and the only real concern would be drop off hazards from getting close to the edge of the brink of the waterfalls at the Middle Emerald Pools (which spills into the Lower Emerald Pools). 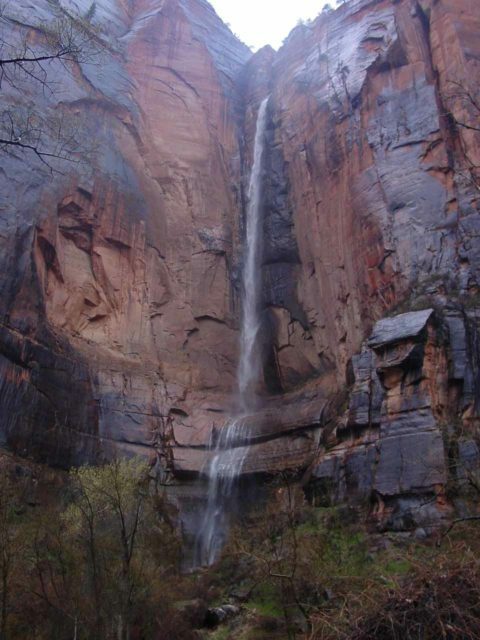 The Zion Canyon Waterfalls reside in Zion National Park. 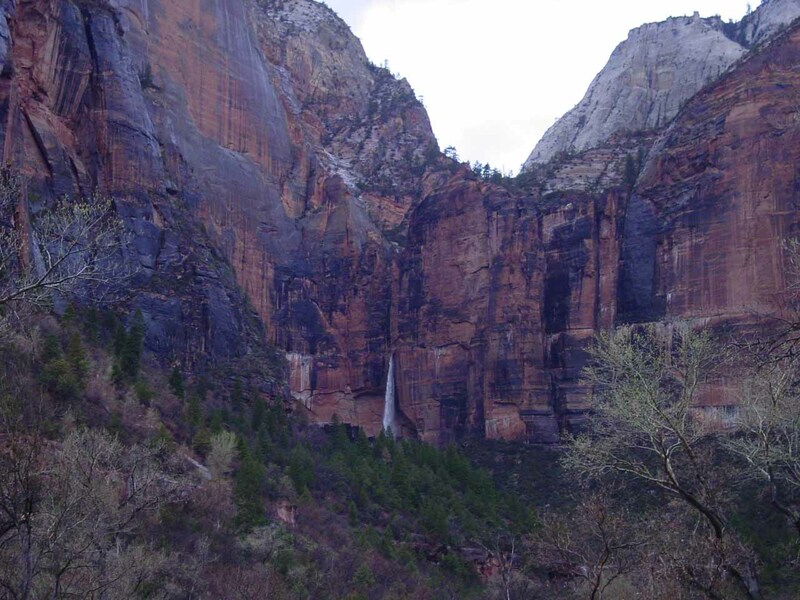 For information or inquiries about the park as well as current conditions, visit their website. 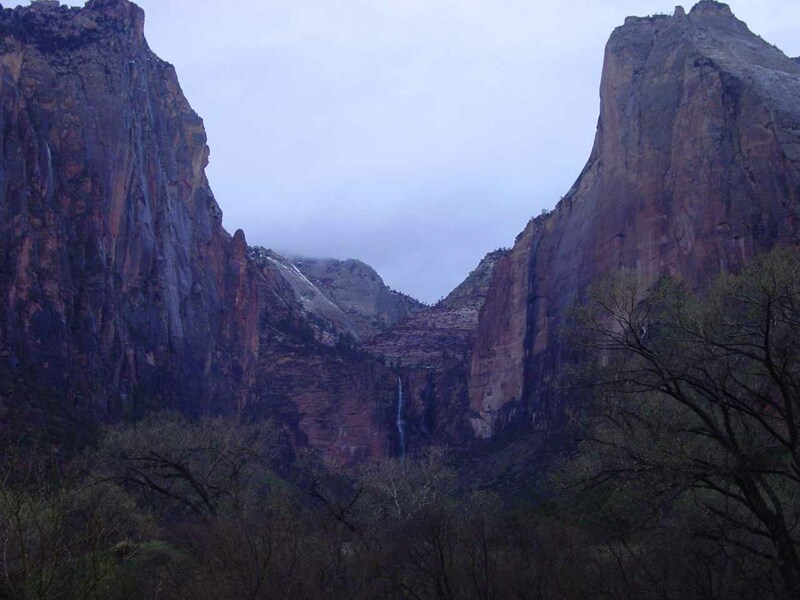 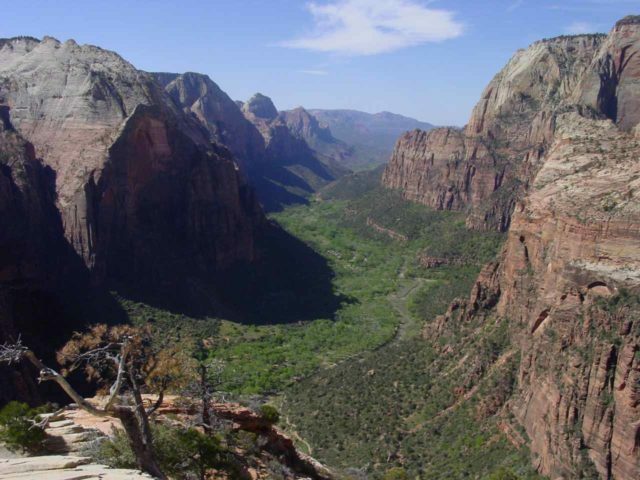 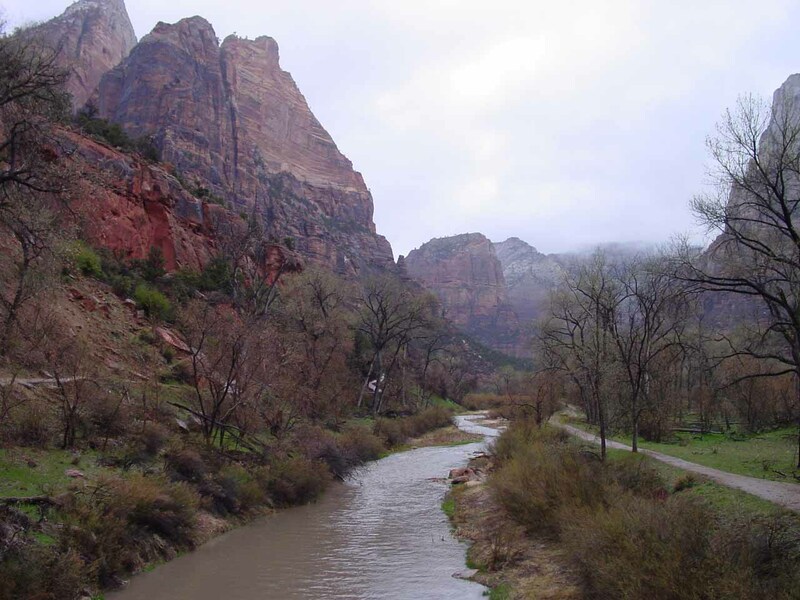 The nearest town to Zion Canyon is Springdale, which is right at the south end of Zion National Park. 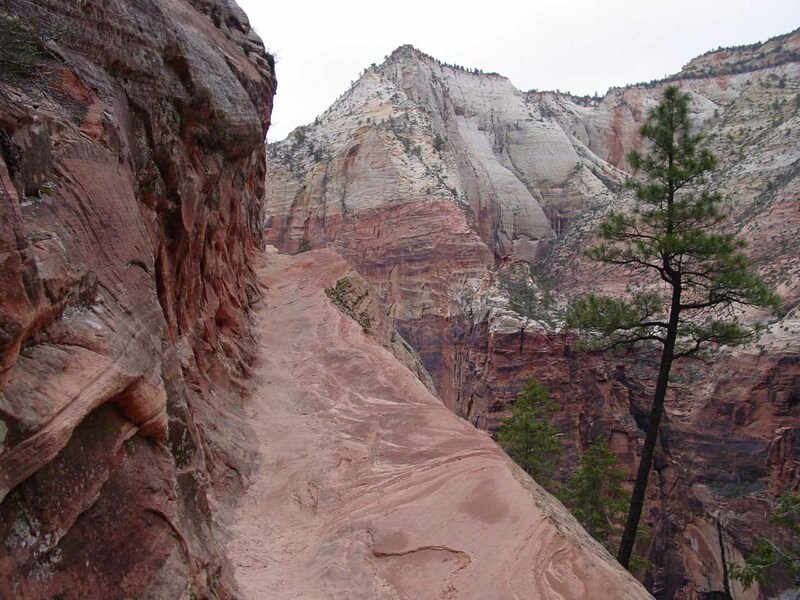 We usually base ourselves in town or at the Watchman Campground, which is near the park’s southern entrance. 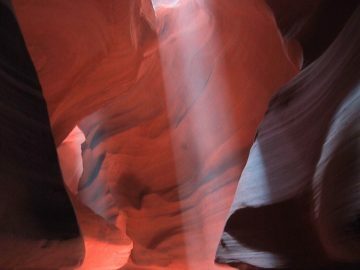 Springdale is about 6.5 hours drive from Los Angeles or 2.5 hours drive from Las Vegas. 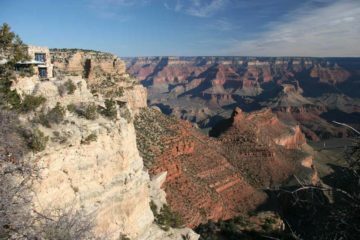 During peak season (sometime in mid April through mid October), private motorized transport is prohibited, and you have to use one of the frequent park service shuttles to go from stop to stop within the canyon. 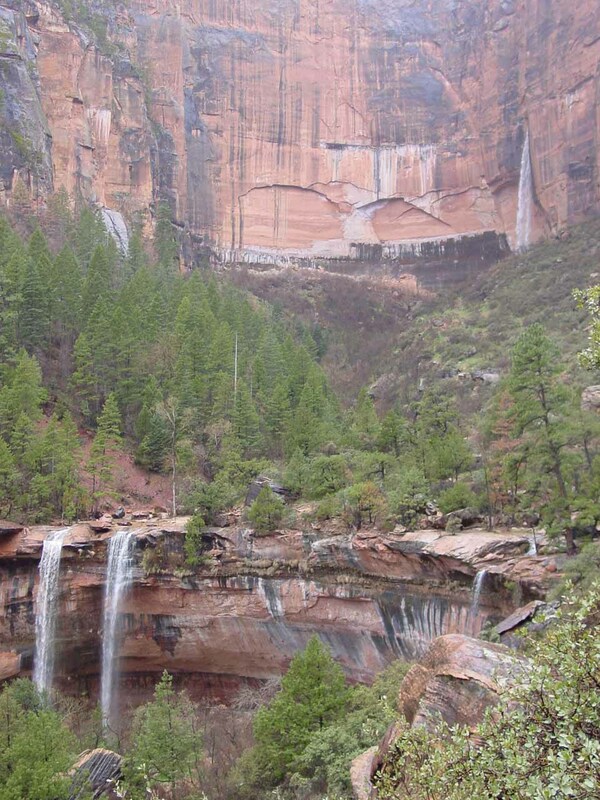 The Emerald Pools is pretty straightforward to find as it’s not too far from the Zion Lodge. 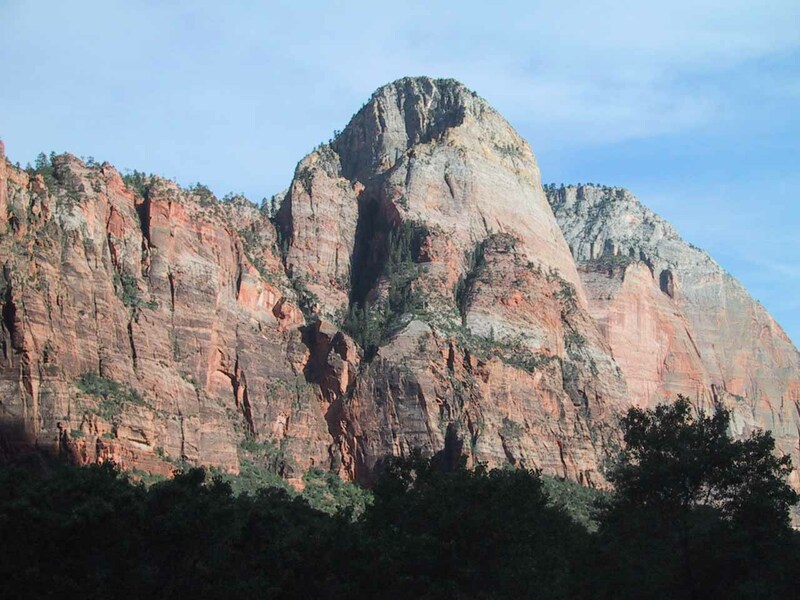 Ordinarily though, the mandatory peak season shuttle would point out the stop corresponding to this hike. 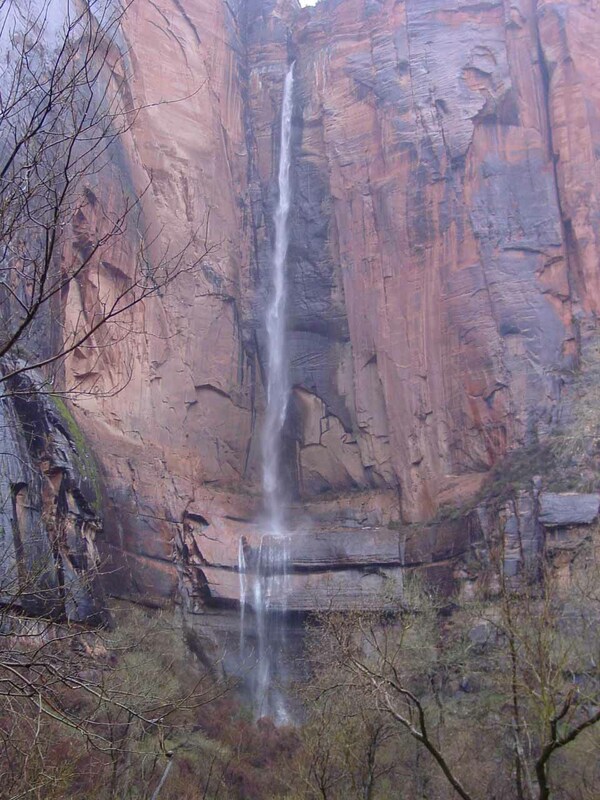 The end of the road would be at the Temple of Sinawava and its ephemeral waterfall. 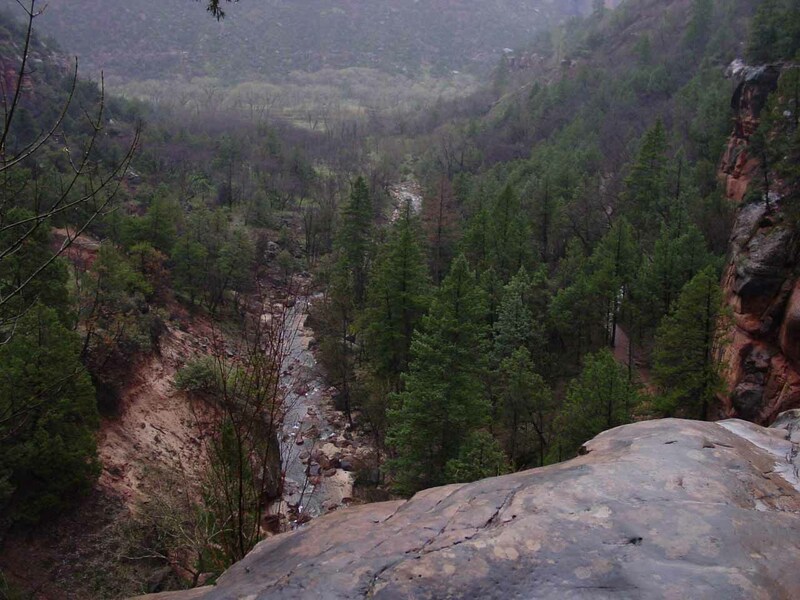 This is also where the Riverside Walk begins. 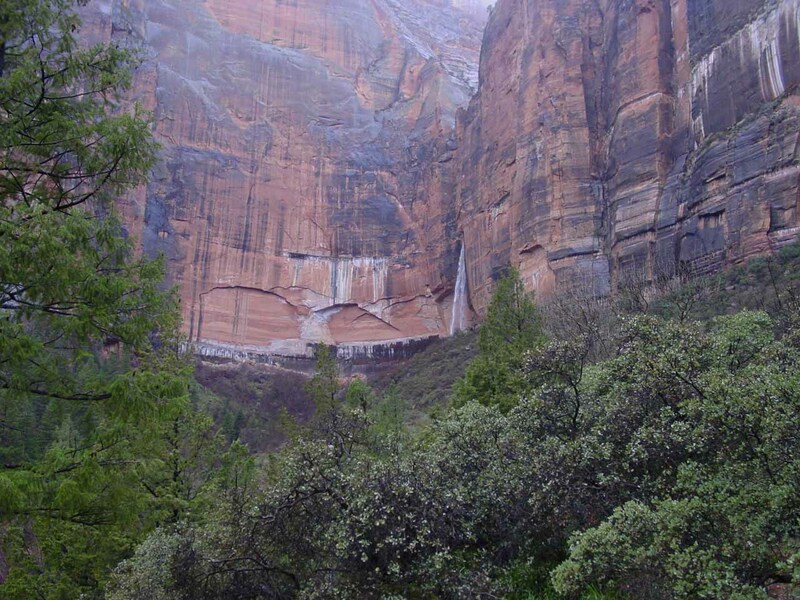 If you could count Weeping Rock as another waterfall, it too has a stop that’s pointed out by the shuttle that’s a few stops before the Temple of Sinawava. 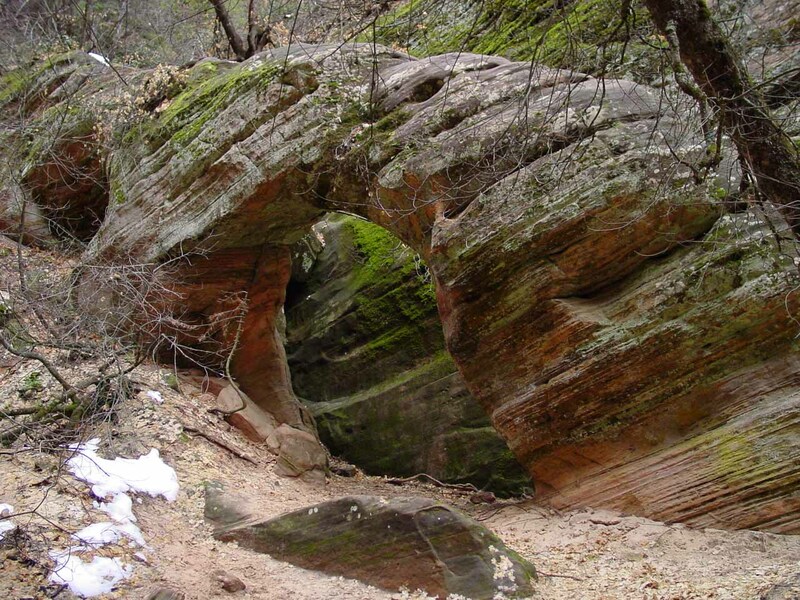 We actually did an interesting hike into Hidden Canyon from here, where we found a small natural arch.